All of us who voted in the election walked away with powerful, if contradictory, reactions. Yet I doubt few would disagree that Mr. Trump’s comments during the campaign were less than “presidential” — denigrating women, immigrants, Muslims, black and brown folks, and the disabled among others. (One poll I saw found that 60% of those who voted for him disliked his behavior.) Regardless, Mr. Trump is now our President-elect and I suggest that moving forward the story needs to become how all Americans show up with each other. Post-election, we as a country are more divided and polarized than ever. We find temporary solidarity and pseudo-comfort with those most like us. We routinely vilify and demonize others most different than ourselves. “Our truth” gets confused with “THE TRUTH”. We think we are more informed but we are only looking at our own version of reality with others who agree with us. So regardless of what side we live in, I realize that we must act to bridge the chasm that threatens virtually every aspect of our lives — family, work, friendships. How we might go about this is a hotly debated topic in the media. My thinking got a powerful boost from a Facebook post from an old friend and client, Shelton Goode (a black man whom I met years ago when he worked at Georgia Power). Shelton’s words helped snap me back to a new and heightened sense of reality about my own work moving forward. Well said Shelton. And I do believe, we will be fine, but not without all of us stepping across difference or at least stepping up to the line that divides us. As a country, we have honed the art of demonizing those we disagree with. The fragmented news and the hundreds of sources inundate us with information, yet we are less informed. We listen to those reporting their version of the news that we agree with. We talk past and through those we don’t agree with and demonization becomes the likely byproduct. I have engaged in it, so likely have you. It is time to stop this. And this helped me realize that the work moving forth is mine and the work of others, regardless of who’s leading the country. It is about what I or you do moving forth in our sphere of control/influence. So, the work now shifts to how you and I respond to creating partnerships. With all this, I find myself with a growing sense of energy for the work ahead. I find myself saying “Deal me in” and I want to ask all of us, especially white men, “Are you in as well?” I am determined to lean-in using love and engagement as the tool of choice to partner across the void of intolerance and bigotry, both in this country and across the globe. Now is the time to lean towards rather than away from each other. Together we can bridge and close this divide that seems to be tearing us apart —neighbor to neighbor, work colleague to work colleague and even family member to family member. Let’s speak out and advocate for the change that is essential to all in our world. I will be the change I wish to see, and so can you. Join with me and other courageous change agents. Figure out how to hang in there with others over the long haul. Please share with me your path moving forward. 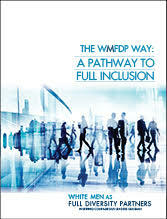 Send me your thoughts or story, your hopes and actions at wmfdp@wmfdp.com. Together we can and must find our critical common ground and common good.